It’s easy to associate certain songs or artists with a point in time of your life. Sometimes they can evoke great memories, but also sad times or tied in to a particular event that occurred. Today’s featured artist has a very special place for me, because the band (and this specific album) was the first CD I ever purchased. The group started in 1984 with a couple guys playing music together in a garage. Based in Cypress, California, the guys attended a show by the band Social Distortion that ended in a riot. They were all hooked—they wanted to be a part of that scene and decided to formally start a band. For a couple years they barely got out of the garage, only doing very local small shows. In 1986 they decided to pin down a band name and they chose The Offspring. They dropped a single on a self-made label. While their effort got some positive reviews from some smaller publications, it didn’t catapult them to success. After recording another demo in ’88, they signed to a very small indie label called Nemesis Records. They would go on to release two records under the label, neither with any significant notoriety. In 1990 they embarked on a six-week national tour, but guitarist Noodles was stabbed during a performance outside of Hollywood. He would end up being okay, but it was a turning point for the band, realizing they needed to either make it, or potentially call it quits. Heading back into the studio in January of 1994, they began recording a new album. Expectations were fairly low, since their last album had sold maybe 15,000 copies. The total budget was $20,000, which caused further strain and meant they often needed to record at off times to get cheaper studio rates. Finally, Smash was released in April of 1994. The album didn’t really take off immediately, but in July the single “Come Out And Play” hit major radio. The album would end up peaking at #4 on the Billboard 200 and multiple singles would come in toward the top of the charts for 20 plus weeks. Sales followed suit. The album has sold nearly 15 million copies to date, and has gone over 6x platinum in the U.S. alone. Given they were still working on an independent label, this was an amazing feat. They have achieved platinum status in almost a dozen different countries and in France; it’s still the best-selling album for any indie label. 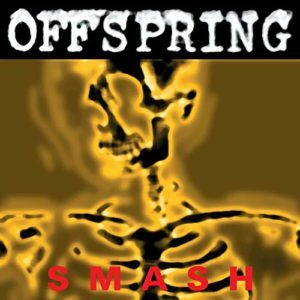 At a time in music history when things were about to drastically change, Offspring was right there as one of the bands leading the charge. Groups like Green Day were starting to get noticed as well for playing that punk rock style. Bands like these two deserve all the credit in the world for bringing punk rock back to the mainstream. Eventually because of the massive radio play, the genre started to be called punk-pop and you could hear it all over the country. It’s easy to feel biased when you have a personal connection to the music. With it being my first album, I think I’ll always have a soft spot for it—but when I go back and listen to this 25 years after the debut, I don’t think it’s lost a step whatsoever. Critical ratings are mostly very positive as well, so I don’t feel totally alone. Was it life changing music? Of course not—but it’s the type of heavy guitar riff rock and roll that never seems to get old. And if you can throw something on nearly three decades after initial release, I think you’ve got a winner. Offspring is still out there grinding today. They have released six additional studio albums since Smash, none of them quite seeing the same success. Don’t feel bad for them though, in total they’ve sold almost 40 million albums worldwide. Come out and play with this one today, it might even boost your self-esteem on this fine Tuesday in February! Editor’s note: In the spirit of full disclosure, four songs on the album have been labeled as having explicit lyrics.